The last time we saw Darren Till competing inside the Octagon was for his first career UFC title shot. Unfortunately for Liverpool’s finest, Till would suffer his first career defeat when challenging the welterweight king Tyron Woodley. Having had much made about his weight ever since he missed ahead of his bout with Stephen Thompson, Till himself admitted that he will one day be a middleweight and that seemed like it could be coming after his most recent outing. However, the Brit isn’t planning the move just yet. 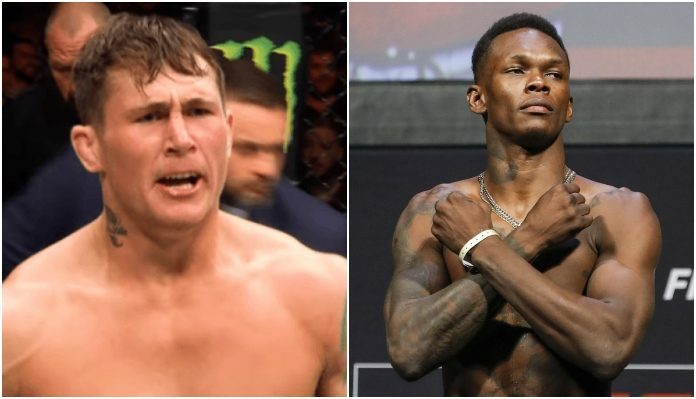 “I’m definitely gonna fight at 185 [pounds] but just cause I made such a big deal out of the cut myself, because obviously I missed weight in Liverpool and the cut turned out to be surprisingly easy [for the Woodley fight],” Till said on the Believe You Me podcast. “It was just easy so I can still stay at welterweight for a few more fights. With no fights lined up just yet for his return, Till has been linked to a fight with Colby Covington but that seems unlikely due to Covington’s current stance in his own situation. Then most recently, Till and Jorge Masvidal have shared a brief back and forth. When it comes to an eventual move to middleweight though, there’s one person that ‘The Gorilla’ would like to test himself against. Funny enough, Israel Adesanya also shared his interest in a matchup with Till in July 2018. Thus making the possibility of this fight all the better of a chance at some point in the future. Next on the table for Adesanya is ‘The Spider’ Anderson Silva at UFC 234 on February 10.